One of my favorite new apps on my Android phone is made by Pendragon Entertainment: USMLE Pharmacology. Definitely recommend it – while I was setting it up yesterday, it asked me about cytochrome p450 inhibitors and inducers so many times that I accidentally learned them. It seems like the first step was being able to recognize that a drug is a cytochrome p450 something. The commonly tested ones, at least on that app, were these: Erythromycin, quinidine, rifampin, isoniazid, griseofulvin, cimetidine, carbamazepine, phenytoin, and phenobarbital. And that’s basically the hard part, because I realized the names themselves are simply divided into “quick” names (inducers) and “slow” names (inhibitors). 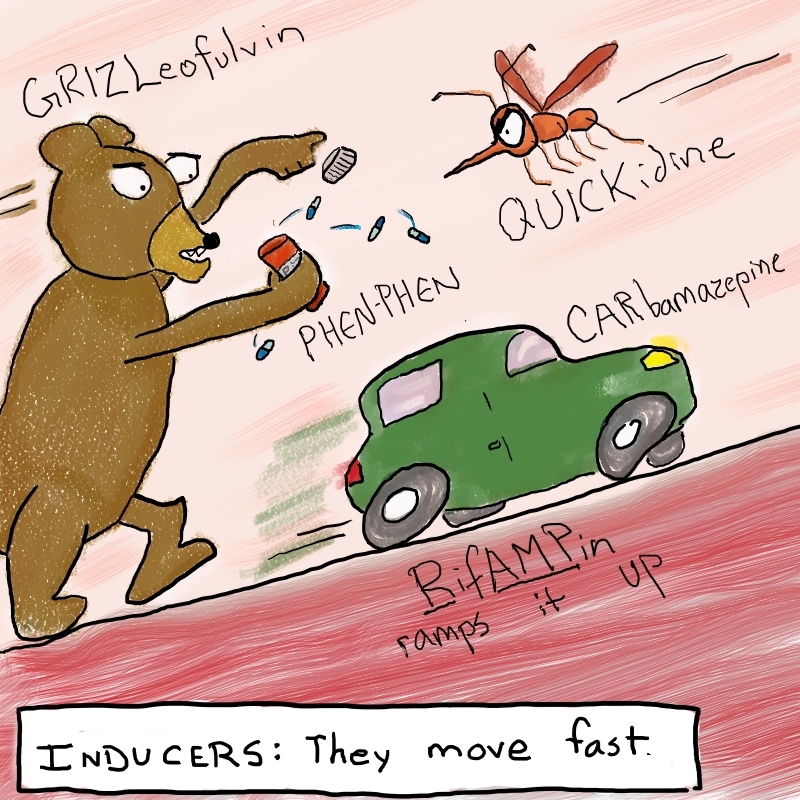 Of course, you don’t need pictures to recognize that QUICKidine, GRIZZLYofulvin, CARbamazepine, RifAMPin, and PHENPHEN (Phenytoin & Phenobarbital) are “fast” names. Similarly, no one should need a poorly-drawn picture to recognize that ICEoniazid, ERRORythromicin, and CEMENTidine are “slow” names. Why is there a block of cement in the middle of the ice rink? I don’t know. Maybe someone just hates that poor robot. This entry was posted in how to, Medical Mnemonics, Medical Trivia by Action Potential. Bookmark the permalink. Yes. Justify that smartphone! Do it. Great mnemonics superbly illustrated. Keep’em coming. This comment is awesome, thanks! I so agree with #1. I’ll remember a picture for years, and it’s always so much easier than memorizing words. Makes me wish I had actually bought Moonwalking with Einstein this summer – it was on my summer reading list, and then it just didn’t happen. Maybe during winter break. I should have seen this a long time ago! superbb. . . . .
I’m Anni, a pharmacist from Finland, I work in a small hospital in Helsinki. Right now I’m preparing a small lecture for nurses about interactions and medicin administration. It’s quite troublesome theme for them and I try to have some ease in it. I ended to wander in Google image search looking for something inspiring about CYP 450-system. Then I saw your drawing about CYP450 inducers with a bear and car and that was something! Now I’m asking if I could show that picture for them in my lecture? Of course I would tell them who has done it. Oh, cool! Yes, you can! You can cite it as from Action Potential (medical blogger) or just throw in a link to my blog, either one. 🙂 Thanks so much for asking! Quinidine is an inhibitor, not an inducer!! Quinidine can both induce and inhibit. Induction is the more important effect according to First Aid. So just finished my negative marking pharm exam and this literally made me smile everytime they asked me an interaction question because well your drawings in my head, they worked. Thank you! The guy driving the CARbamazepine is a drunk, because chronic alcohol use also induces. The ERROthromycin robot can’t make functioning sperm, and so is sad because he has AZOLESaspermia, as azoles are inhibitors. And three points to whoever figures out why there’s grapefruit juice on the ice. Thanks a lot. I’m a pgy4 psych resident, studying for our yearly exam, PRITE. This made it sink in, though I chaged car to carburetormazepime (carburetors speed up the car, just works for me, in case I ever what the car means, which can happen when you think too, too hard). Grapefruit juice on ice must be because of the BRRRRgamottin that it contains. I love mnemonic devices! interesting. i ve never seen mnemonic illustrated in pictures like this. keep it up. quickidine = quinidine??? 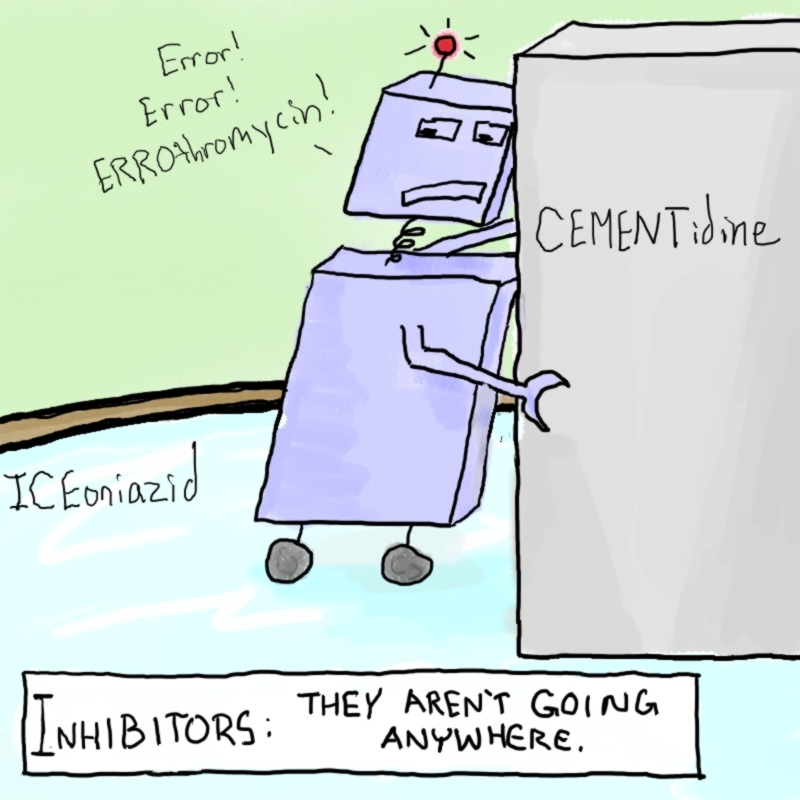 I thought that is an inhibitor….